At some point in the future, when you order a pizza, you may be surprised at the taste — with odd ingredients added not by the ingenuity of the chef standing behind the counter twirling dough, but an artificial intelligence program with its own idea of a savory pie. What's happening: McCormick, the world’s largest spice company, has begun working with IBM Research to create new spices that humans might not consider. Among its latest concoctions — the cumin pizza, says Richard Goodwin, principal research scientist at IBM. Why it matters: AI is starting to change our palate, and not just when it comes to food. As we've previously reported, AI is introducing novelty and creativity into food, in addition to fashion, art, cocktails, and dance. "The computer doesn’t have some of the same biases we have," Goodwin tells Axios. How it works: The system, which is still in the testing phase, pulls from decades’ worth of data on spices to identify a base formula for a flavor category (such as a BBQ sauce). Then it incorporates new, sometimes surprising ingredients, as well as sales and trend forecasts, to make sure the new flavors perform well. 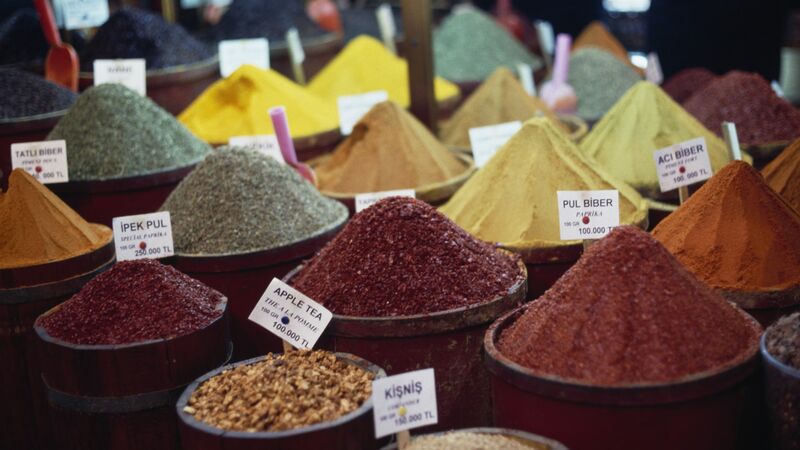 The algorithm can cut spice development time down by two-thirds, CNN reports. By the numbers: The IBM system can examine hundreds of thousands of formulations that have been tried in the past, involving some 5,000 ingredients. "A person just can’t deal with that," Goodwin says. At the end, humans make the decision: A consumer taste-test follows the AI process. "There's always going to be a need for humans to taste," Bob Doyle, VP of the Robotics Industries Association, tells Axios. Driving the market: "Consumers are expecting ... our products in the food and beverage world these days to be better," said Maria Velissariou, chief science and technology officer at the Institute of Food Technologists. "They need to have nutritional content, they have to be high quality, they have to be accessible, and they have to be affordable." Carlsberg has used machine learning to predict what beer will taste like, and Foodpairing helps restaurants devise ideal cocktail and meal pairings, per CNN. This year's Super Bowl ads highlighted how torn society is over the promise of Big Tech. Some spots showed dystopian fears surrounding robots and automation, while others highlighted ways new technologies can improve health care, employment and connectivity. Why it matters: The conflicting messages underscore the debate happening right now about whether automation and artificial intelligence will displace humanity or save it. On one side, ads from TurboTax, Michelob Ultra and Pringles showed ways robots and voice assistants can't compete with human intelligence and emotion. Even Amazon ran a lengthy ad poking fun at the hiccups from its Alexa voice assistant. On the other, tech companies like Google and Microsoft tried to showcase their human side with ads highlighting ways their companies aid veterans and children with disabilities. There was also an irony in the millions of dollars spent on ads by streaming video companies. Netflix, Hulu, Amazon Prime and YouTube TV all purchased spots Sunday, serving as a reminder that traditional television — and particularly the Super Bowl — is still considered the top destination for high-level branding. Another major theme this year was the power of female protagonists. Bumble, Toyota, Wix, Amazon Prime and Hulu all ran ads showing the power of women in sports, in the workplace, and in society. Anheuser-Busch InBev drew ire from corn advocates and farmers for a series of ads that dismissed using corn syrup in beer. Verizon drew some online criticism for its ad lauding first responders, which didn't mention that the company throttled data for first responders in California in August. T-Mobile took Twitter heat for ripping off an old internet meme. Noticeably absent from the game this year was Coca-Cola, despite the fact that the Super Bowl took place in its backyard. The Atlanta-based beverage company ran a simple animated ad before kickoff, but let Pepsi take the spotlight this year with several spots and its usual half-time show.